While I’ve talked at length about my love of coconut oil for skin care, I’m excited to finally dive into the benefits of honey and using a coconut oil and honey face mask. If you’re skeptical about slathering honey and coconut oil all over your face—don’t worry, I was too. It took me at least a year to finally work up the nerve to put natural oils on my face and clean my face with coconut oil. Now, I’m a huge fan of natural skin care, mostly because of how it’s completely changed my skin. Why Do a Coconut Oil and Honey Face Mask? Facial masks are beneficial because they provide concentrated nutrients to skin. Typically, they’re made from a single nourishing ingredient, like clay or honey, or a combination of ingredients depending on your skin’s needs. 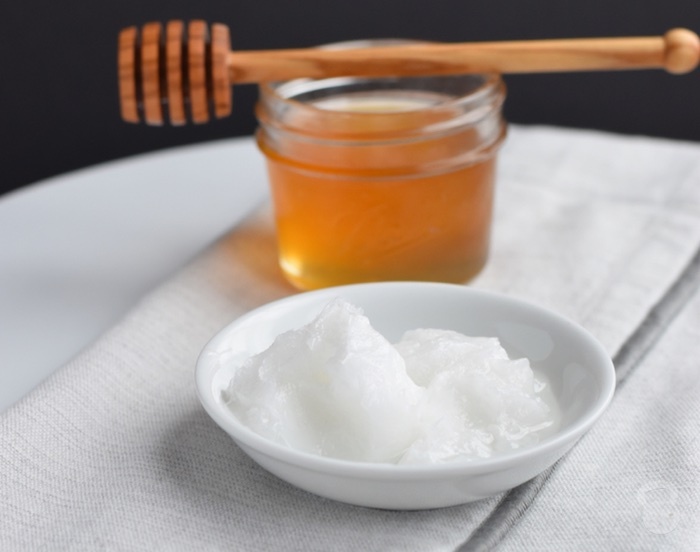 While raw honey serves as a spectacular sweetener in the kitchen, it also can be incredible for your skin when mixed with coconut oil and applied topically. Honey is hygroscopic, which means it absorbs water molecules from the air and retains moisture. It also has strong antibacterial, antiviral, and antifungal properties, making it great for acne-prone skin and other inflammatory conditions. Honey contains varying concentrations of polyphenols, which are powerful antioxidants that counteract the effects of free radicals, and may help repair damaged tissue. It also contains alpha hydroxy acids, which makes it a great gentle exfoliator. In short, because honey has moisturizing, antimicrobial, and restorative properties, it’s great for using as a homemade face mask. It also may help improve a variety of skin conditions, which makes it great for all skin types. After using this coconut oil and honey face mask, I highly recommend using an apple cider vinegar facial toner. This will help freshen skin and remove any excess residue of the face mask that may have been left behind. Mix raw honey with coconut oil and lavender essential oil (optional) by stirring with a toothpick or small spoon. If mixture is too viscous, throw it in the fridge for 5-10 minutes. Once it’s hardened slightly, remove from fridge and whip it with a spoon. After cleansing your skin, apply DIY coconut oil and honey face mask across your face with your fingers using small circular strokes. Leave mask on for 10-15 minutes. 1. It’s important to make sure you use raw, organic honey from a trusted source. I recommend purchasing it from Y.S Organic Bee Farms, or Tropical Traditions. 2. As with all natural skin care ingredients, please make sure to spot test this coconut oil and honey face mask on your skin, especially if you have sensitive skin. There is no such thing as one size fits all skin care, and it is possible that honey and coconut oil may not be right for your skin. 3. Coconut oil’s melting point is 77 degrees Fahrenheit. So, to mix evenly, the coconut oil must be cooler than 77 degrees, but not completely solid. If honey is too hard, heat up for 2-3 seconds in the microwave and stir with coconut oil. 5. The lavender essential oil is completely optional. Lavender essential oil is included because it has antimicrobial and antioxidant characteristics, which may help with acne, and can be an effective way to soothe inflamed or irritated skin. 6. Please be careful with the ingredients you choose to put on your face. For example, lemon juice and cinnamon are sometimes suggested, but both can irritate the skin, especially when exposed to the skin in concentrated doses. 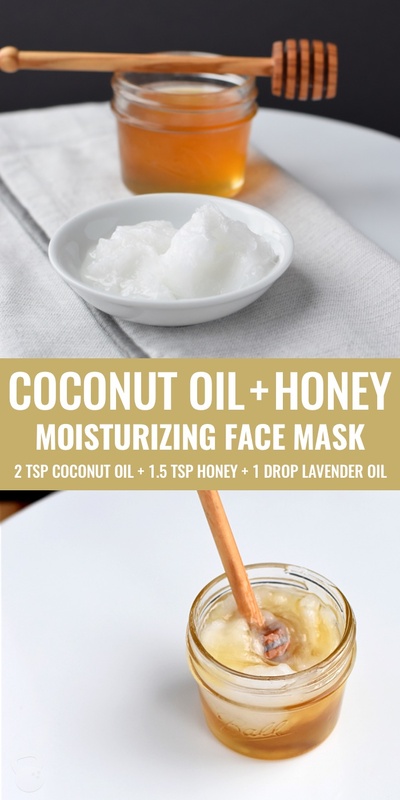 Have you tried this coconut oil and honey face mask? Let me know your experience below! I don’t have a problem with using microwaves here or there when I need to quickly heat something! 🙂 Do you use microwaves? And yes, if it’s hard – like, can’t actually move it, that’s when you’d put it in for 2-3 seconds. Raw honey in the winter can get pretty thick and hard. Hope that helps! I am going to try the coconut and honey mask. The coconut natural skin care is great. I know you sent it to me but now I can’t find where I put it. I was using this and I should have wrote everything down. Is there anyway to get this again. 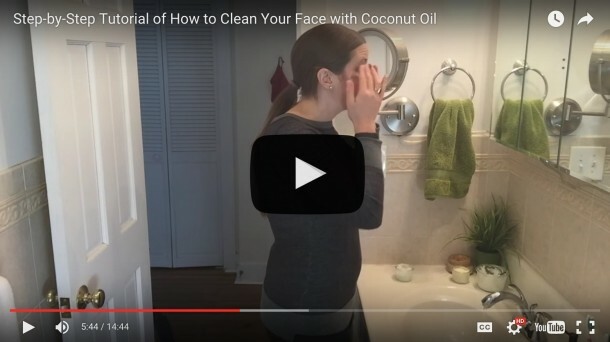 I love the coconut oil, it is amazing and so much easier than most skin care products and steps to follow. Oh! Yes! I totally agree! I hadn’t ever bought it though, thenprice seemed kinda crazy , but it’s sonworthbit! I got it initially to use for my precious kitty cat who had a BooBoo, I know how healing Manuka is , so I sorungnfornit! SO glad I did! It healed her problem and I didn’t worry it could harm her if she licked~lol didn’t think either that she could just lick it ALL OFF! She didn’t and it was a miracle for that situation! It’s SO antibacterial!! I know just Raw Honey is also but yes, Manuka is for sure Super Charged so much so they “Graded “ the type I have! The higher the number, the more powerful! LOVE IT! That’s what I used was manuka honey and coconut oil! You can do whatever you need to do to get it heated! 🙂 Microwave is just the easiest. I have just come across your website and I am obsessed. I have switched to baking soda shampoo, ACV rinse, ACV toner and coconut oil face washing method. So in love and happy about my decision to switch. I am wanting to try this as well. How often would you recommend doing this? Thanks for sharing Noelle. I have tried coconut oil and apple cider vinegar for both hair and face. They are very good and I feel my skin and hair are invigorated to their top natural state. Will try honey as mask when I can get a bottle of raw organic honey. Thank you again for all these great info. Thanks, Ribb! Let me know how it goes! Athena! Yes I do! I personally love using this DIY facial serum as a face moisturizer, and this homemade aloe vera moisturizer. Hope that helps! Would jojoba oil be okay to add instead of lavender? Can I pre make this and store in a glass jar for a few uses? Absolutely! The ingredients are shelf-stable. Can you use regular honey and still get the same results? Hi Alicia! I don’t recommend using regular honey for this. Raw honey is much different than commercial honey. I’ve linked to where you can purchase this above if you can’t find it locally! Commercially sold honey is heat treated above 50 degrees to allow it to easily flow through filters. This destroys the healing benefits of cold extracted raw honey. For the same reason raw honey should NEVER be microwaved. Standing in warm water will lower its viscosity to allow it to be more easily mixed. Body temperature (37) is sufficient for this and won’t affect the beneficial attributes of raw honey. Raw honey can also be applied as a salve to heal anti-biotic resistant bacteria, particularly golden staph. Is it okay if we do not have raw honey? I have 100 percent pure clover honey( at least that is what it says). It is in liquid form. Thanks! How often can you do the mask? As often as your skin needs! Everyone’s skin is different, so I recommend experimenting to see what works best for you. Nope! 🙂 Please read Coconut Oil for Skin: Everything You Need to Know for more info! Oil is wonderful for oily skin! Skin gets oily because it’s dehydrated, so hydrating it will make it less oily. Coconut oil is a great way to do this. Hi Noelle, how many times per week should I put this mask? does this face mask help with dry skin on your face? Love your revipes thank you for being so informative I’m going try these along with your other recipes. I usually wash my face with coconut oil and washing it off but I never thought of steaming my face to open my pores and doing it that way. Thank you! Do you have a link to your ACV toner? And do you apply this when face is still warm or should you wait till it cools down and pores close.? I just used a honey baking soda mask because I’m battling very dry flakey skin. The baking soda was a little too abrasive and now my skin feels dry and tight. TIA! This was amazing! Had to keep myself from eating it LOL!! Can I use rose water as a toner after this face wash as it is what i’m currently using. Also, Can i use this as a daily wash rather than just once a week? Also, how long can i store this if i make a bit in advance? Hi Zainab! Do whatever works for you. Please use the toner that works best for you, and do this as much as your skin needs. Both honey and coconut oil are shelf stable, so please follow the guidelines according to what your specific bottle of honey/coconut oil state in terms of shelf life. Came across this recipe this evening while treating myself to a little “self care” spa night. It’s lovely! Even as I type this, I can feel it soaking into my skin. Lavender works wonders for soothing headaches as well! It’s a double win. Thanks so much for sharing this! Fantastic! So glad you enjoyed it! How long does this face mask last? I was going to make some for my mom for part of a Mother’s Day gift, but I was wondering if I could make it a couple weeks before or if I had to make it a few days before. I haven’t thought of this but, I’ve been using a Honey/Lemon face mask for about a month now and it works great, but every now and then I’ll break out, then my acne will be gone. I was wondering if it’s okay to use either a honey/lemon or honey/coconut oil mask twice a day? Or does it depend on the kind of face wash you use before putting the mask on? Hi Bailey! It really all depends on what works best for your skin. I recommend cleaning your face with coconut oil, and seeing if that helps. Should I put lotion on after the mask? And also should I shower first or after mask? You can if you want! The mask itself is moisturizing so you may not need to. Do what works best for your skin! Hi my daughter gets alot of blackheads and I have large pores, will this mix help with both issues? Could i add a little bicarb as an extra exfoliate? Possibly! Best thing to do is test it out and see if it works for you! I don’t recommend changing the recipe and I have never done that personally. Hi ! I would like to make a bigger batch to give as a part of Christmas gifts.. how long can it be stored in a jar ? Both can be stored at room temperature! Hi! I just started coconut oil for cleansing and so far so good! I just have a question though ’cause choosing the right product is a little confusing for me, which is better? virgin coconut oil or extra virgin coconut oil? Thank you! I reaaally appreciate your blog! They are actually the same! See How to Choose the Right Coconut Oil. I love your website and the Well Fed Women Podcast! Keep up the great work! 🙂 Quick question, when I do this face mask should I cleanse before with coconut oil, then use the ACV toner after the face mask? Or should I use ACV toner before I do the face mask? Great question! I would apply the mask on a clean face, and then after the mask apply the toner. Hope you love it! I love the idea of this mask;however, I’m having trouble with applying it. I mixed it and even put in the fridge for a little. As soon as I put it on my face it just starts melting off and dripping everywhere. How do I prevent this?? It might be the ambient temperature of the room or the type of coconut oil and honey you are using. Best option is to use a raw honey (which will be almost solid at room temperature) and a cold-pressed coconut oil (note, NOT fractionated coconut oil). Put it in the fridge until solidified, and only use a small amount. I have some eczema. Would the coconut oil still be OK? I’ve read some mixed things like that it can “feed” the fungus/yeast. Hi Annie! Totally individual. Helps for some, and for others, it doesn’t. I’d do a little testing to see how your skin responds! How long can you store this mask for? Both items are shelf stable and you should consider the best by date on the label. Can I use the residues of the mask for more than once? Or should I make a new one each time I decide to put the mask on? I have never used coconut oil on my face. As winter is coming, I will definitely use this mask. But I have a question. Can I use tea tree oil instead of lavender oil? My skin is super dry. I tried this face mask after which my face turned soft and bright. The texture of the mask feels very rich. There was a noticeable luster on my face. Do you recommend using a toner before applying the mask so that the skin can absorb the ingredients better? How frequently can this mask be used? A toner is a great idea! Glad the mask worked well. Try once a week, and increase to 2x a week and see how your skin responds! 🙂 I also highly recommend a nourishing moisturizer for day/night that is specific to dry skin. If you’re struggling, try something with safe active ingredients, like the Countermatch Day and Sleeping Cream. I have dry skin and it’s what I use personally. Can peppermint essential oil or an essential oil blend of peppermint, tea tree, or lemon essential oils be used instead of lavender oil? You can use any skin-safe essential oils as long as it’s diluted appropriately.